Oberhausen, right in the middle of the Ruhrgebiet, which is right in the middle of Germany, ranging from Duisburg to Dortmund. D�sseldorf Airport is about 25km from Oberhausen, D�sseldorf-city about 35km. D�sseldorf is nearest "bigger city" and has the nearest Airport and you can go directly by train from airport to Oberhausen. Now you can take the Bus or the Tram - Station: Neue Mitte. Walk to the O-Vision-Park: 10 Min. Using a car to the venue: Motorway A2/A3 At motorway interchange turn on A 516 direction Oberhausen. Then left on B 231 direction Oberhausen CentrO. Motorway A 42 Departure "Oberhausen /Neue Mitte". Heading "Oberhausen CentrO". Motorway A 40 from Duisburg Departure M�lheim D�mpten. 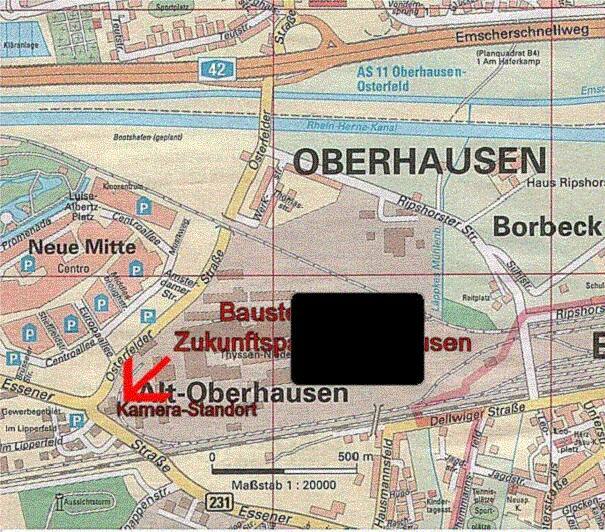 Twice left in direction Oberhausen, Follow the street till end and then left. O-Vision-Zukunftspark: opposite the Osterfelder Str. The "venue" is a field near the "Neue Mitte" and "Centro" Shopping centre. Actually, it's more of a building site, so expect lots of mud, should it be raining on the day. Be prepared to go there early. About 80.000 tickets will be sold and there is a nearby shopping center, so there might be lots of traffic. You can park in the shopping center (hopefully) and you might be able to park near the site. This place is a building site, as they are building the O.Vision area there www.ovision.de. Hopefully that will not disturb the show and the arrival and departure in any way. Thanks to Peter J�tten, Dieter Heine, Robert van Otterloo and Johannes Delmere for information!